Kinsta would not be here without all of your great feedback and we appreciate all of you who have taken the time to speak up. Over the past couple of months, we’ve analyzed and logged all incoming suggestions, criticism, and ideas. We wanted to address these as quickly as possible. Therefore, instead of doing a holiday sale this year, we decided to focus our efforts on adding more long-term value across the board; for both new and existing clients. After all, the holidays are only temporary. We’ve heard from a lot you, mainly developers with smaller sites, that the lack of SSH on our lower-tier plans was a big let down. This has slowed down your workflows and prevented great projects like Bedrock and Trellis from being used. Therefore, the first big change we’ve made is that SSH access is now available on plans, from Starter plans through Enterprise. Previously this was only available on our Business 1 and higher plans. This also means that Git and WP-CLI are also now accessible across the board. We hope as developers, this will help make your lives a little easier! Connect via SSH to your Kinsta server. You can start cranking out those WP-CLI commands. Last week, we upgraded all servers to the newest WP-CLI v2.0.1. 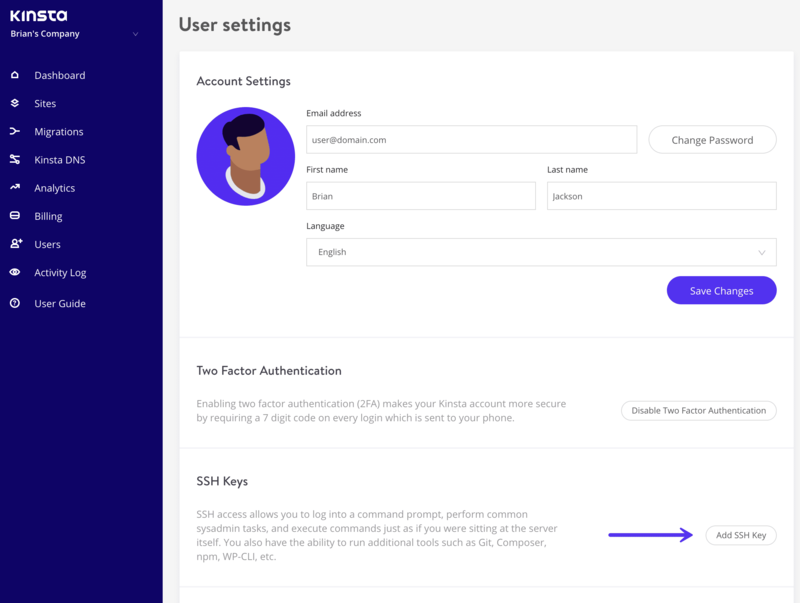 Don’t forget, you can also now easily add your SSH keys in the MyKinsta dashboard. One of the biggest criticisms we’ve heard is that we don’t provide enough disk space (SSD storage) on our lower-tier plans. And while we have found that many users severely overestimate the disk space they actually need, we still agree. Especially for those of you with bigger files and media. Therefore, we’ve added more disk space on our Starter, Pro, and Business 1 plans. We know for some of you, migrating a WordPress site is a pretty big deal and it can be overwhelming. Previously, only our Pro and higher plans included a certain number of free migrations. However, we’ve found that those on Starter plans are typically the ones who require the most help with migrations. Therefore, all Starter annual plans now include a free migration. This includes those paying annually by credit card and wire transfers. Those eligible for our non-profit and open source project discounts can also take advantage of the free migration. We definitely don’t want to hinder anyone’s ability to give Kinsta a try, so let our expert team handle your website’s migration. We hope this makes your transition to Kinsta a little smoother! And don’t forget, for a limited time (through November 30th), we are offering unlimited free migrations from WP Engine and StudioPress (see details), as well as from Flywheel (see details). We hope you like all of these changes and please keep all the feedback coming!